Not only is TwispWorks a great place to explore and shop for unique local art and goods, it’s also a great place to hold your next gathering! Whether you are looking for the perfect spot for your next workshop, board meeting or office holiday party TwispWorks offers an assortment of event spaces. From birthday parties to art classes to community meetings the Education Station is a great place for your next gathering. The Education Station comfortably seats 40 and has easy access to a kitchen, front and back decks and projector and screen. The Gateway Conference Room is ideal for your next committee or board meeting. 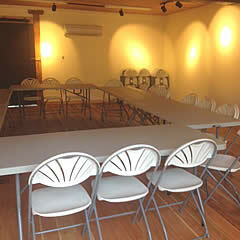 The room easily seats 12-16 around a large board table and a projector and screen are available for use. Sure it’s chilly right now but spring is just around the corner and TwispWorks offers a number of outdoor spaces and amenities for next year’s picnic, performance or wedding rehearsal including the 14,000 square foot Plaza@TwispWorks. INFORMATION/RESERVATIONS: Reservations and details are available on the TwispWorks website or by calling their office: 509-997-3300 extension 1.